North American Green’s 6-inch Circle Top Pins and V-Top Wire Staples are specially designed for use with the Pin Pounder. The V-Top Wire Staples have two legs for increasing holding power in loose soils and areas subject to frost heave. Both fasteners can be used in nearly any type of soil. Both fasteners are made from sturdy, 11-gauge wire and have a flat surface that sits flush on the magnetic head of the Pin Pounder. 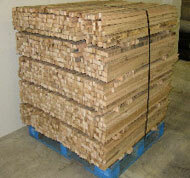 Circle Top Pins are banded in easy-to-handle bundles of 10.